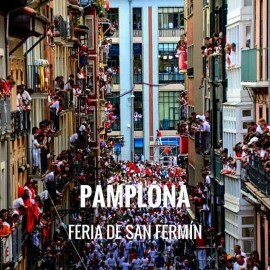 The city of Pamplona, called Iruña in Euskera, is the capital of Navarre and celebrates one of the most famous festivals in the world: the 'Sanfermines'. Each year, in the month of July, Pamplona stays awake for 9 intense days of celebrations where the most important thing is the bull and where visitors from all corners of the planet come. 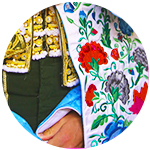 Although the patron saint of Iruña is San Saturnino, it is San Fermín who takes all the honors of the major festivities. The 'chupinazo' (a rocket), launched from the balcony of the City Hall every July 6 at 12.00 pm, kicks off the festivities until July 14 at midnight, ending with the singing of 'Pobre de mí'. The Sanfermines reached their worldwide fame thanks to Ernest Hemingway and his book 'The sun also rises'. The writer enjoyed them and was part of them on several occasions between the beginning of the 20s and until the 60s; universalized the parties and approached a number of important people of culture. To this day, it continues to attract people from all over the world. 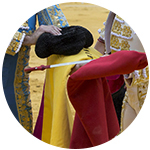 The Bull Fair is held from July 5 to 14 in honor of San Fermín, hence its colloquial name of Sanfermines, and the big day is July 7, the saint's feast. 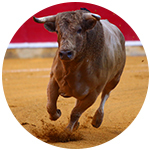 Eight are the 'encierros' (bull runs) that are held, between 7 and 14, every morning at 8.00 am o'clock from the Corrales del Gas to La Misericordia, where they are fought in the afternoon with the most prominent bullfighters of the season announced. Only the best irons are present in the Fair and for this, they review some of their best ones of the litter. The 'encierro' of Pamplona has a route of about 800 meters and is the most important worldwide. 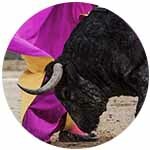 However, the Bull Fair begins on July 5 with the steers-bullfight, and the bullfight with horses on the 6th. In addition, every morning after the bullfight celebrates heifers and various popular celebrations take place during the Fair. The Pamplona Bullring is one of the most important, both for the full that registers in each celebration of San Fermín (it is difficult to get tickets), as for the international projection that enjoys. Address of Pamplona Bullring: Paseo de Hemingway s / n, 31002 - Pamplona. Category: second, but for the importance of the Bullring and the Fair is considered of first. In 2018 the great winner was Roca Rey with two Great Doors in succession, cutting a total of six ears. Francisco de Manuel also left on shoulders the steers-bullfight on the 5th; Hermoso de Mendoza, Leonardo Hernández and Roberto Armendáriz on day 6; Octavio Chacón with the Cebada Gago bulls and Padilla in the farewell of one of their most important squares. We regret to inform you that, currently, Servitoro does not have tickets for this show, but we recommend other bullfighting experiences a few kilometers from Pamplona. Servitoro, bullfighting news Pamplona Bullring, Cádiz.